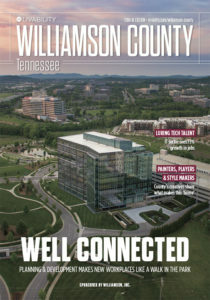 Livability Williamson County, TN 2018-19 now available | Williamson, Inc.
Williamson County, Tennessee – Williamson, Inc. unveiled Livability: Williamson County, Tennessee, the latest edition of a web and magazine marketing program designed to promote the area and draw new business, visitors, talent and investment. Stories promoted online at www.livability.com/williamson-county highlight the community’s excellent quality of life, attractions, live entertainment, restaurants and must-do activities. The latest content features how Williamson County is one of the most pet-friendly places, with special programs geared towards rolling out the welcome mat for pets and pet-owners alike. Discover why Williamson County is rapidly acquiring the nickname, “Music County” with an impressive line-up of great live musicand talented artists, and learn how Williamson County businesses are making a global impact.